Rocky is my pick male from CJ's second litter. 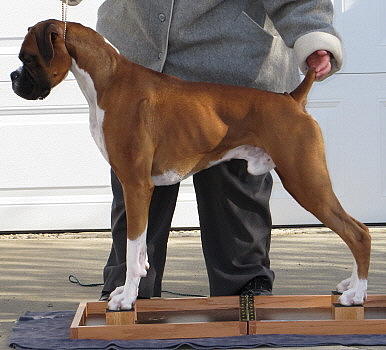 He is co-bred with Rhonda McNutt of Country Time Boxers. Rocky is co-owned by myself, Cindy Thomas, with Donna Rode who also owns Rocky's great uncle Ch. CynTech's Sharp Dressed Man (Kosmo) and he resides with the Rode family here in Red Deer, Alberta! 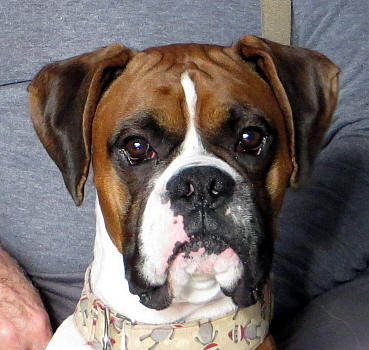 Donna is hoping to do pet therapy with Rocky in the future but in the meantime watch for him in the conformation ring! On November 5, 2010, in his very first show at 7 months of age Rocky wins Winners Male & Best Of Winners for his first 4 points under judge Mary White (USA) and wins Winners Male, Best Of Winners (4 points) & Best Puppy In Breed under judge Charles Trotter (USA) from the 6-9 month class at the Red Deer & District Kennel Club shows!! He was handled to these wins by his breeder & co-owner, Cindy Thomas. On November 28, 2010, Rocky wins Reserve Winners Male under judge Patricia Hastings (USA) at the Calgary Kennel & Obedience Club show!! He was handled to this win by his breeder & co-owner, Cindy Thomas. On February 5, 2011, Rocky wins Reserve Winners Male under judge Edd Bivin (USA) at the Calgary Kennel & Obedience Club show!! He was handled to this win by his breeder & co-owner, Cindy Thomas. Flash! On March 25, 2011, Rocky wins Winners Male under judge Nancy Tibben (Canada) but since there were two absent class males no points were awarded and on March 26, 2011, Rocky wins Winners Male, Best of Winners for 3 points and Best Puppy In Breed under judge Joe Tacker (USA) to finish his Canadian Championship from the puppy classes at the Battle River Canine Association shows!! He was breeder/owner handled from start to finish by Cindy Thomas! Rocky is the 1st Canadian Champion for his dam Country Time's Black Pearl (CJ) and the 1st Canadian Champion for his sire Can. Ch. CynTech's Mad Dash To Sherwood CGN, TT (Brady)! !